Good day everybody, it is time for another, sadly long overdue, update on the Witch Hunter project. I had hoped to be a tad further by now, but real life keeps putting up those hurdles. In between work, studying and trying to get my provider to actually provide internet I have had very little time this last week. As said before these awesome guys are a combination of Pig Iron bodies (link) and some Elysian drop troop heads I got from Forge World. I bought the bodies on a whim, something which is rather unusual for me. There was just something about the design that pulled me in, add a spare Elysian head I had in my bits box and a simple, but effective conversion was born. It took me about 10 minutes of fiddling around with the bits to come to the conclusion I wanted a group of these, so I ordered 5 more bodies and some Elysian from FW (whose bits will be used somewhere down the line I'm certain). Naturally these guys needs some extra work to make them a bit more 40K. So I'm thinking that they need a purity seal here and there, a pouch or two and maybe some extra radio equipment on the guy with the antenna stuck to his head gear. 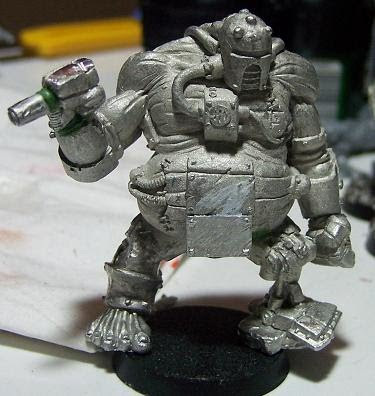 Moving on we have the some work on the second count-as Elites Inquisitor - Proctor Valarak. Given that the above Stormtroopers have a bit of a police, or Arbites, feel to them I thought it only suitable that their 'special character' would be something along the lines of an Arbites judge. 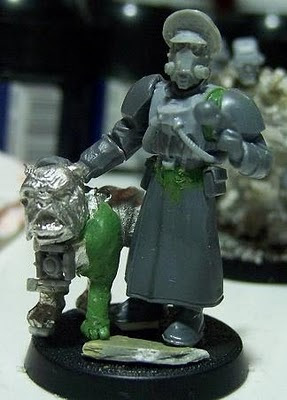 I actually took the term Proctor from an Arbites character in a Dark Heresy book (Purge the Unclean I believe). The little extra piece on the bottom of his rebreather actually comes from the Elysian chest piece, the tubing on it originally led up to a respirator mask on the chest. Now it serves as some kind of techy thing, that still needs some work of course. Originally I was going to get one of those Necromunda cyberhounds, but I just love this beasty so much I couldn't resist settling on him! I've been wanting to us this mini for years and now I finally get the chance. This guy was originally a Cyborg Bodyguard from Sacred Sword miniatures, a company that I fear had gone the way of the dodo. Their last update is well over 4 years ago, though some of their minis still seem to drift around in some online (Ebay) stores. So that does it for this update, I'll do my best to get some more stuff done soon. 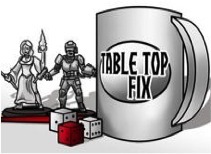 Or, at the very least, make certain I put up some more update this week about whatever is going on in my little corner of the wargaming universe!